Energy label rating of A+++ for LG Electronics’ new Therma V air-to-water heat pump. 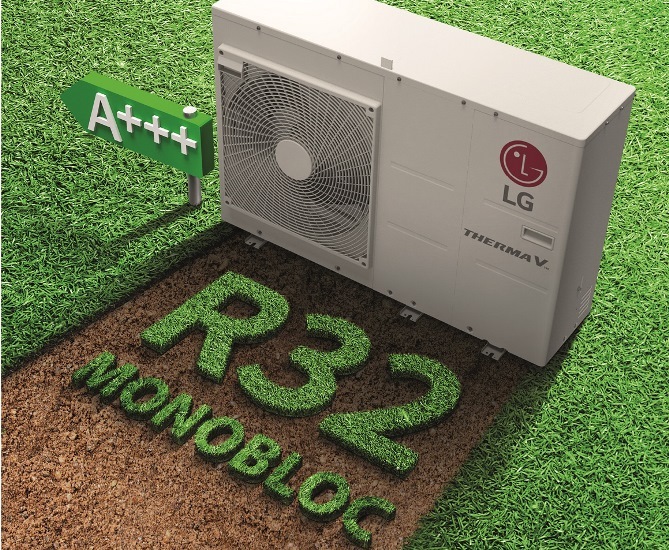 LG Electronics has added its latest Therma V air-to-water heat pump to its popular range, operating on the low GWP R32 refrigerant. It is available in 5kW to 16kW 1Ø and 12kW to 16kW 3Ø, in a wide operating range of between 10-135Hz and water temperatures up to 65°C without an electric heater. It comes with an energy label rating of A+++. The new version of the Therma V Monobloc contains a plate heat exchanger, expansion tank and a Grundfos water pump. The new unit has a higher capacity due to the choice of refrigerant along with a lower GWP, when compared to R410a. The electric heater can be installed as an optional accessory as this is not always required. The latest unit has a 5 to 6dB lower sound power level than previous models and incorporates a number of additional new features including a new type scroll compressor, designed and manufactured by LG Electronics with ‘wet vapour’ injection. The unit has excellent performance at low ambient temperatures – 100% at -7°C. LG also has a mobile connectivity package called ThinQ – an app that connects to home appliances. ThinQ enables monitoring of a home from virtually anywhere in the world. This includes controlling, viewing energy consumption, or sending operational data to your service engineer. This innovative smart home technology is changing the way people run their homes, while taking the efficiency and convenience of their appliances to new heights. To find out more about LG’s new Therma V R32 AWHP, visit partner.lge.com/uk.